'Red Gables', originally built by Josiah Lombard and Marshall Ayers, both of Lombard & Ayers & Co., petroleum refiners (later Tidewater Oil Co.). 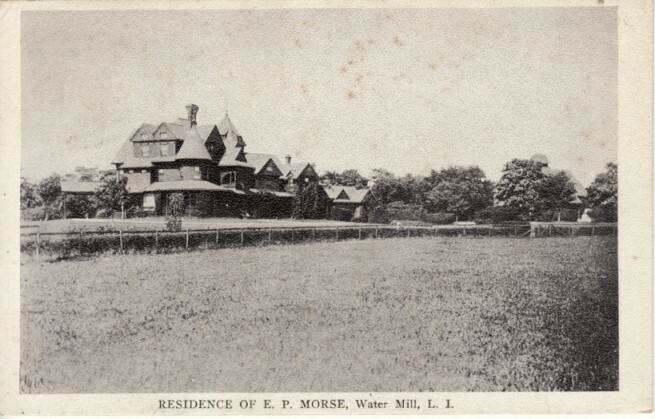 The residence was sold to Dr. Edward Lawrence Keyes in the 1890s and to Edward Phinley Morse in 1909. Morse, founder of Morse Dry Dock and Repair Co., Brooklyn, changed the name to 'Grey Gables' and in 1919 hired Frank Freeman to redesign the house, changing it from a shingled Queen Anne into an Italian Villa. Click HERE to see 'Grey Gables' on google earth and HERE on bing. P.S. Hurricane Sandy...please do not destroy the north and south shores. Thank you. Oh, it's THAT place. Looks as if it's getting the full billionaire treatment back in private hands. Zach, do we assume that your prayers for the North and South shores leave the middle of the island on its own? No...my comment was not aimed at the winds but the expected 5-10 foot storm surge. I am more concerned with the beaches, shoreline and homes that may sit on either. The middle of the island will be fine (minus lots of downed tree limbs and power lines). As of 3:49 Carnegie Hall is in serious danger of being hit by the partially collapsed crane at One57 on West 57th Street. If, when the winds pick up in a few hours, it breaks off and comes crashing down to street level I fear Carnegie Hall might be devastated. Hopefully the FDNY and DOB are working to secure the broken half to the building in case it comes off entirely. As of 4:08 Governor Cuomo said parts of Bayville were being evacuated. Mangano says West Shore Road was impassible as of 4PM. I have a brother and 3 nieces with homes in Bayville - along the causeway to Centre Island is flooded over, village is impassable - and the worst is yet to come with the high tide surge this evening. Scroll down for pictures of Southampton after the Hurricane of 1938. Does anyone recognize the mansion on page 99 listed as W.K Vanderbilt in Brookville/Jerico? I've tried googling it, but all I come up with is a mansion that burned down that looked nothing like the photo. The house looks vaguely familiar, but I can't place it (mentally or physically). Anyone have any input? HPHS - Thanks! I'm a big fan of your knowledge. By the way, where did you get the cross section and interior shots for 640 Fifth ave. on your blog? I can't find them anywhere but there! Any chance of a lead to a floor plan? I'm working on one in CAD based off your description, but can't get it to work out right. I have no electricity and very little access to the Internet for the time being. Con Ed expects to have the power back on by the weekend. I was in Old Westbury today after having to leave manhattan but before any utility trucks made it out. From a tree perspective....Old Westury was utterly devastated. No previous storm comes close to the carnage I witnessed today. Wheatley Road suffered severe damage and the entrance allee at Spring Hill was almost entirely destroyed. The trees that run along Post Road at the foot of Erchless were ripped to shreds. In some areas the trees were very clearly blown over but in other areas they literally appear to have exploded. I can only assume the rest of the north shore got it this badly. very sad. WillLDS - photo and text come from the Vanderbilt book - no floor plans unfortunately. Downed trees, water and sand everywhere, gas, oil, chemicals covering the landscape, cold, no power, lost pets... sad indeed! I haven't seen North Shore pictures, but the ones here of NYC are shocking.